Tennis complexes—some state-of-the-art, some classically old-fashioned—continue to provide players and spectators the opportunity to embrace the game. From junior to amateur to collegiate, all the way up to the professional level, tennis is a sport that people of all ages can enjoy. Whether you prefer singles or doubles matches, tournaments or laid-back exhibitions, indoor or outdoor courts, there is a multitude of dynamic complexes all around the country that provide the very best opportunities to improve as a player and appreciate the game of tennis. From California to New Jersey, here are 11 of the most impressive tennis facilities in the U.S.
Plans for a massive tennis facility in Berry, Georgia, had been ongoing for years, and much to the delight of tennis players in the South, groundbreaking finally began in June 2015. Expectations consist of 54 courts on a 30-acre site with six NCAA regulation courts, three center courts for collegiate play and one exhibition court. The most impressive features of the Rome Tennis Center might be its clubhouse and porch—the former spans 3,846 square feet, and the latter overlooks main event courts, providing panoramic views so spectators don’t miss any of the action. All courts are lighted and equipped with shade cabanas to allow players an escape from the hot Georgia sunshine. Berry is certainly a big tennis community, and its position between Atlanta, Birmingham and Chattanooga make it an accessible and ideal tournament setting. Rome Tennis Center will only make this location more popular. When your tennis facility is situated in a community where Serena and Venus Williams live, it’s a good sign that the venue is serious. And the BallenIsles Tennis Center is certainly serious. Twenty-two courts—20 clay and two hard—grace the 62,000-square-foot sports complex, while a separate stadium court conveniently seats 500 spectators. The facility also contains the Tennis and Fitness Lounge, a skybox-like building where members can watch and relax with food and refreshments. It isn’t hard to find a good match to take in at BallenIsles—invitational tournaments often feature world-ranked players and even Grand Slam champions. Beyond highly-competitive events, the club offers clinics and other tennis-oriented social activities for players of all skill levels. The city of Charleston is a hotbed for the sport of tennis, and Charleston Tennis Club is its centerpiece. The numbers are impressive—13 outdoor courts, six indoor courts and a pro shop with all the newest equipment and accessories. The surrounding area makes it easy to host an event at the complex, as it offers a two-mile hiking trail and a 2,000-square-foot fitness center. The latter contains a heated outdoor swimming pool, a basketball court, strength and cardio machines, a playground and patio dining areas. Charleston Tennis Club regularly holds youth tennis camps, in addition to competitive tournaments throughout the year. 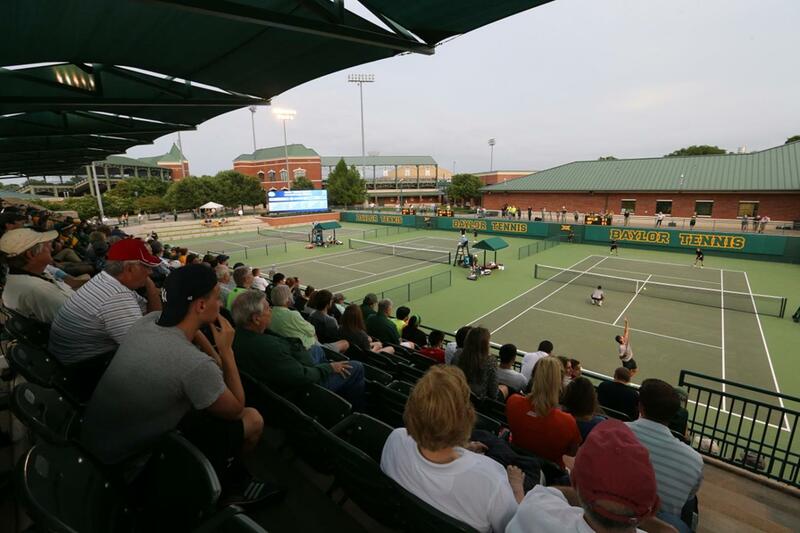 Hurd Tennis Center, home to Baylor University’s men’s and women’s tennis teams, consists of 12 outdoor courts and the Hurd Tennis Building, where all the administrative operations of Baylor tennis take place. In addition, the complex houses Jim and Nell Hawkins Indoor Tennis Center, which features six courts and allows for year-round practice opportunities for student-athletes. The facility has been renovated often since its grand opening in 2001, and in 2015 Tennis Magazine named Hurd Tennis Center the best college tennis venue in America. Locker rooms at the complex never fail to impress Baylor players and visiting athletes alike—each one has a computer and a projector to go with a large overhead screen so players can watch film and improve their skillsets. With state-of-the-art amenities, Hurd Tennis Center offers the Baylor Bears a unique advantage as they train and compete. Wintergreen Tennis has two main facilities—one in Devils Knob and another in Stoney Creek. Both sit up against the Blue Ridge Mountains and boast the type of amenities that make Wintergreen one of the top resorts in the United States. The Devils Knob complex boasts three indoor courts and 15 outdoor courts, in addition to a full-service pro shop and a private classroom for video analysis. Over in Stoney Creek, four outdoor, poolside courts give tennis players the opportunity to relax in the sunshine while looking out at the breathtaking mountain ridges. 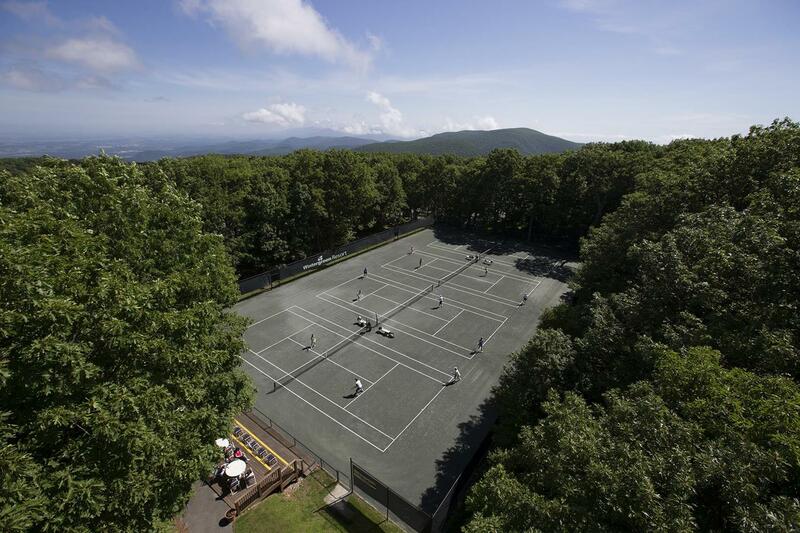 Wintergreen is known for top-notch tennis academies, where kids and adults can learn the game and hone their skills. Not convinced of Wintergreen’s value? Tennis Resorts Online recently called it one of the top 20 tennis resorts in the world. You can’t beat the beauty of the Resort at Longboat Key, where 20 Har-Tru tennis courts sit peacefully along the coast of the Sarasota Bay. 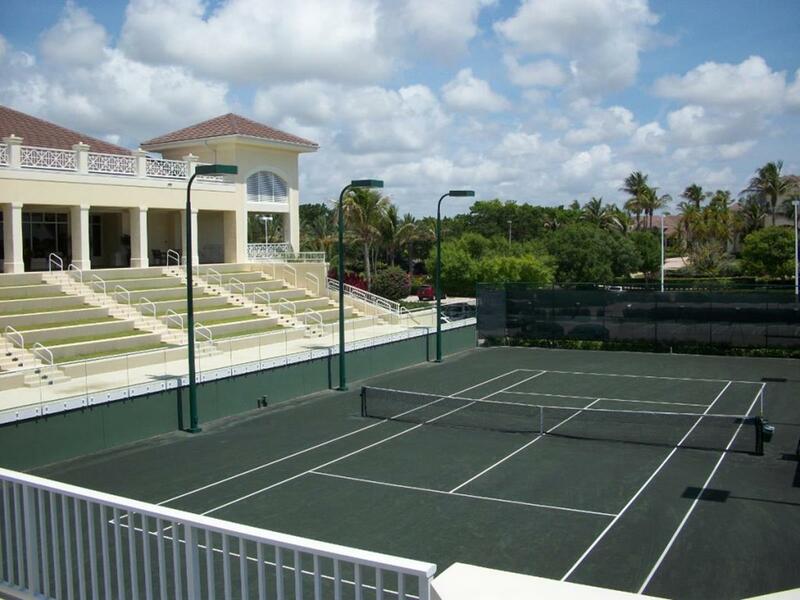 Tennis Resorts Online has praised Longboat Key’s tennis facilities, ranking its pro shop No. 1 in the country and calling the resort the sixth-best of its kind in the world. Members love playing and viewing tennis at this venue—the Court 21 Café and Lounge has terrace seating, making it an enjoyable place to eat, relax and watch a match. The new HydroGrid irrigation system is also a nice touch, while regular professional tennis instruction and renovated locker rooms make the tennis facilities at Longboat Key an attractive option for tennis enthusiasts around the country. 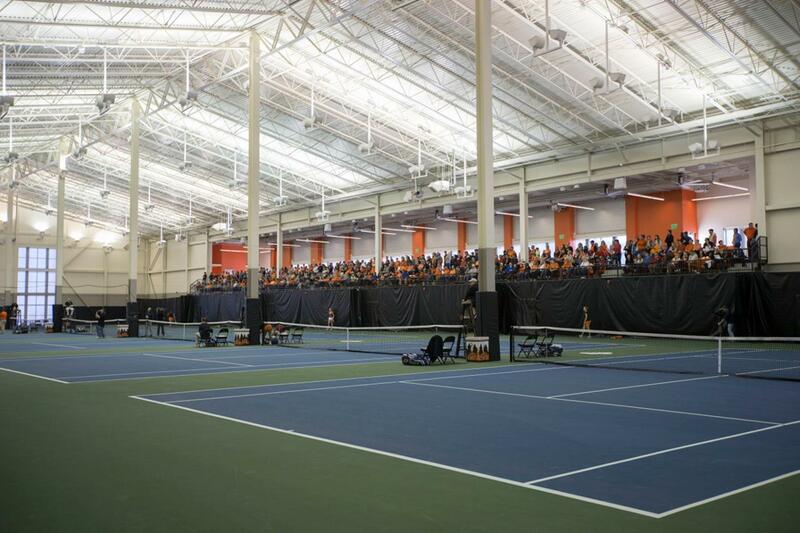 Home to the Oklahoma State Cowboys, this two-year-old complex spans 50,000 square feet and consists of 12 outdoor and six indoor tennis courts. The indoor facility, which can hold 350 spectators, also contains coaches’ offices, locker rooms and a sports medicine hub, complete with a state-of-the-art hydrotherapy center. 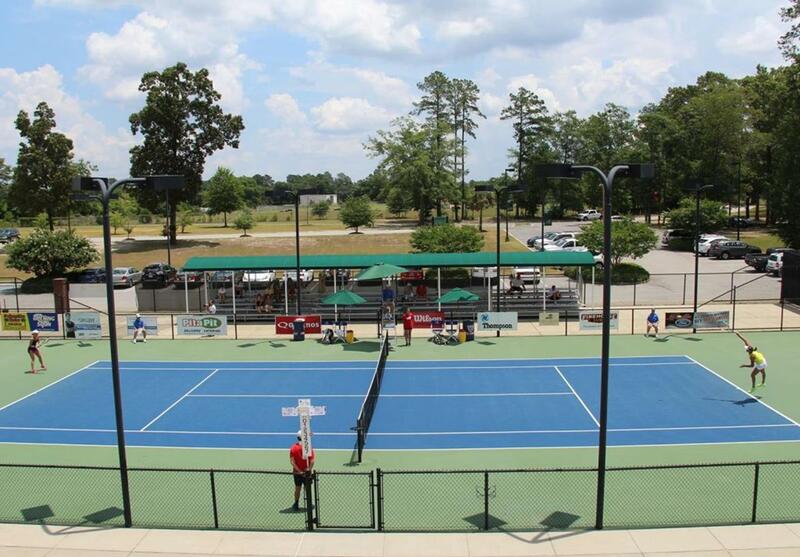 The United States Tennis Association has crowned this venue one of the two best collegiate facilities in America—because of its great reputation, Greenwood Tennis Center has been pegged to host a variety of tourneys, including the 2014 ITA Central Regional Championship. One of the Big 12 Conference’s finest tennis hubs, this complex consistently offers Oklahoma State a distinct home-field advantage. 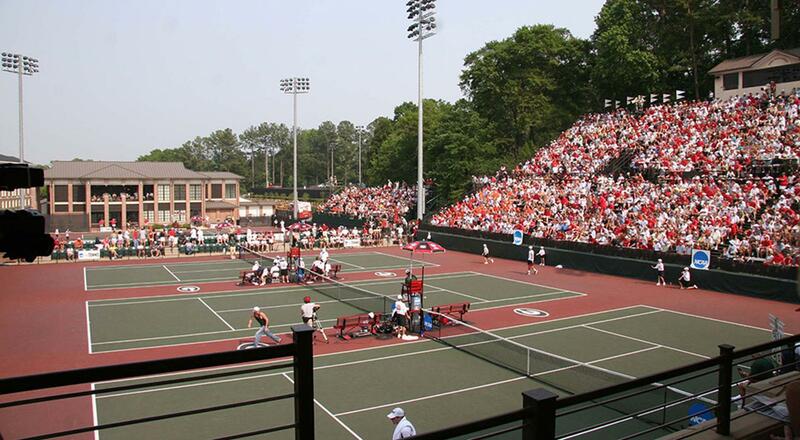 The Dan Magill Tennis Complex at the University of Georgia is one of the largest on-campus tennis venues in the United States, seating over 5,000 fans and boasting 16 total courts. Due to its unique size, the Magill Complex has hosted the men’s NCAA Championships 24 times and the women’s NCAA Championships three times. The combined NCAA Championships will return to Athens in 2017, having been held there last in 2014. The facilities were renovated in 2002, with brand-new clubhouses for both genders. Beyond top Bulldog tennis players, superstars like John McEnroe and the Bryan brothers have graced the Georgia’s courts, cementing the complex’s standing as a prominent site in both the collegiate and professional ranks. Looking to escape for a weekend from the hustle and bustle of daily life? If you enjoy playing tennis, there’s no question that Rancho Valencia, home to 18 spectacular plexi-pave championship courts, is the place for you. 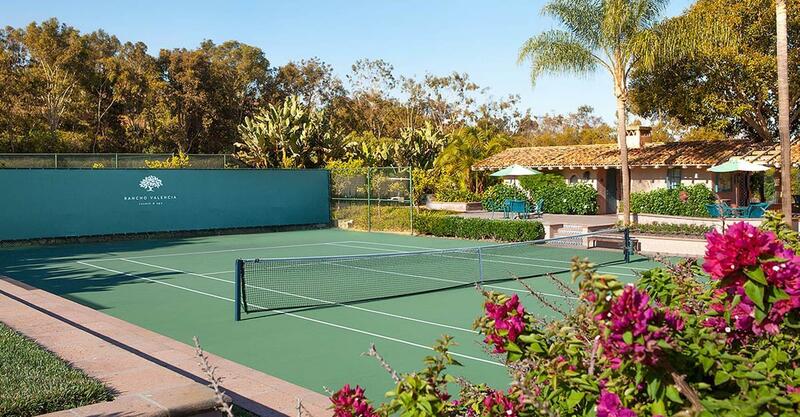 Rated as Southern California’s top tennis getaway by Tennis Magazine for the past eight years, this resort sparkles with all the amenities and advantages you could ever imagine. Rancho Valenica offers junior tennis lessons from an experienced staff of USPTA and USPTR professionals, while members of all ages and skill levels can enjoy tournaments and clinics. The 45-acre resort is a dynamic attraction, boasting a spa, two restaurants and a fitness center. Though these aspects are enticing by themselves, there’s no denying that Rancho Valencia is known best for its award-winning tennis program. One of the Garden State’s finest indoor tennis facilities for over 43 years, New Shrewsbury Racquet Club consists of 12 indoor hard courts, a top-of-the-line pro shop and a private fitness center. Open year round, the complex has been lauded for its exceptional tennis programs taught by a group of certified professionals. The club runs a number of USTA junior tournaments every year, in addition to being the site of many USA Team Tennis competitions. While New Shrewsbury Racquet Club may not boast the size of some other facilities on this list, it has other advantages, like free WiFi and babysitting, which make it a great place to play or watch the sport of tennis. Beautiful weather and delicious Southern cuisine aren’t the only advantages of booking a vacation in Sumter. The city is also a great place for tennis—Palmetto Tennis Center boasts 24 state-of-the-art courts and is always lit for playing during the evening hours. While young children will appreciate that the complex is situated next to a playground and spray park, those serious about the game of tennis will be thrilled to hear that three professionals offer private, on-site lessons and group clinics for players of all skill levels. With two ball machines, stringing service, party restrooms and a pro shop, Palmetto has all the tools necessary to be considered an elite facility. 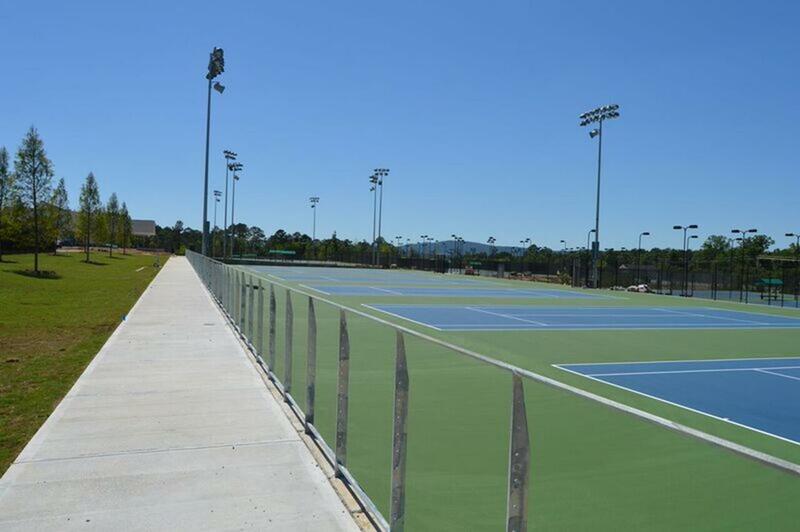 In 2016, the venue is scheduled to host the Palmetto Pro Open Women’s 25K and the USTA Zonal Team Championship, in addition to the Palmetto Tennis Center Invitational for college players from the Carolinas.